The debut paperback collection of Paul Cornell's Demon Knights practically cries out to have been a hardcover instead, with all the covers shunted to the back such to give the illusion of a graphic novel. 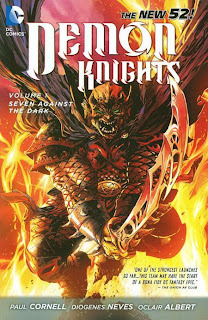 Whereas collections like Grifter and Batgirl include a couple of the heroes' disparate adventures, Demon Knights: Seven Against the Dark is a single, tightly-coiled story about seven anti-heroes caught in the siege of a marauding army, immediate and unrelenting and meant to be read in full. Demon Knights is wholly enjoyable, a book that creates and simultaneously proves the validity of a medieval fantasy title in DC Comics's New 52. In true Dungeons and Dragons fashion, Paul Cornell brings together the seven members of the Demon Knights in a tavern; they do not incite the battle with the Questing Queen's conquering horde, but they're soon embroiled in it. Over the book's seven issues, many of the Knights make personal sacrifices to try to save the town of Little Spring; by the end, however, with Little Spring mostly destroyed, their victory is dubious. The townspeople suggest surrendering to the Questing Queen a number of times, but the Knights keep fighting irrespective, and it is mostly the townspeople -- including a young girl, a young boy, and a priest -- who pay the price. Cornell distinguishes here between the war and the warriors. The Knights fight because they've been attacked and because it's in their nature to do so, but not because of any loyalty to Little Spring in particular. They try at times to rouse the townspeople to fight with them, but ultimately the townspeople who show the most bravery -- including the boy and the girl -- are the ones who die. In a way Cornell's Demon Knights is a superhero story turned on its head; the heroes don't fight to save Metropolis, but ultimately they fight simply because an opportunity to fight presents itself, and their success in the end is hardly discernable from a failure. The kind of morally-gray mayhem found in Seven Against the Dark may remind some readers of Gail Simone's Secret Six. The Knights don't all get along; the team includes two pseudo-villains in the form of Etrigan the Demon and Vandal Savage; and there's significant in-fighting (including some bloody injuries) among the group. Between Madame Xanadu's complicated romantic relationship with both Jason Blood and the Demon; the Shining Knight's gender ambiguity; and a bit of gore just a tick higher than the average DC title (though that's a fine line that gets finer all the time), Demon Knights emerges as a surprisingly mature fantasy title, something likely to appeal to the Game of Thrones crowd. It is also, lest this review suggest otherwise, at times pretty funny. Already Cornell begins laying the groundwork for what must inevitably be a crossover between Demon Knights and the larger DC Universe. With Savage, Etrigan, and Xanadu, the wizard Mordru also appears -- whereas the former three have or are about to make appearances in other DC New 52 titles, Mordru is regularly mentioned in Legion of Super-Heroes, giving one out-of-time DC book a connection to another (hopefully the twain shall meet). Readers know from Cornell's Stormwatch: The Dark Side that the Demon Knights are an early version of the Stormwatch team (one Knight is referred to as "the Engineer," but other antecedents aren't so obvious); as well, Seven picks up a homonym also found in Grifter, suggesting the "Demon Knights" may face the alien "Daemonites" sometime soon, too. All of this is a joy for those who like that sort of thing, that the Demon Knights may be time-displaced but certainly not separate from the DCU. In total Demon Knights is a markedly better debut than Cornell's Stormwatch. The latter seemed to bow under the weight of its precedence -- too many established characters to reintroduce, too much going on at once, and too much effort made to seem smart and snappy, when instead Stormwatch just seemed clutter and confused. Demon Knights is airier, not in the least because the characters only face one threat in seven issues. This gives Cornell and artist Diogenes Neves room to spotlight each of the characters separately and in comparison to one another; the second issue alone has plenty of room for Etrigan, Xanadu, Vandal Savage, Shining Knight, the Horsewoman, and Mordru and the Questing Queen, neither feeling rushed nor too slow. Again, Demon Knights: Seven Against the Dark has essentially the character of a well-plotted graphic novel; it stands out among the best of the DC New 52 debuts. Next up, the Collected Editions review of Batman and Robin: Born to Kill. Be there! I had a feeling that this would read well as a collection. Of all the New 52 I've read so far, this is the one I worry about the most with cancellation prematurely ending something wonderful. Interesting review - lots of insights on the story that make me rethink my opinion of this title. I dropped it in floppies about where this collection ends for two big reasons: I felt like I was reading chunks of a collection and not a monthly title (something your review seems to support), and I never really felt emotionally invested in any of the characters beyond, "Oh, look what Wacky Character #5 is saying/doing now. Catchphrase!" Maybe I went into this title all wrong. I think I was looking for the next "Secret Six" but didn't find it at all. Maybe I'm just not as big a Paul Cornell fan as I thought I was. Y'know what, that's it. I think I like Cornell's writing when he's playing in a sandbox, not when he's building a world, in an ongoing. I never quite knew what this book was supposed to be - medieval adventure, zany team-up, Stormwatch prequel, significant tie-in, insular world - and not knowing a book's identity bothers me. Knight & Squire was just the right amount of kooky British hijinks, but any more might have been insufferable; Stormwatch tried to do way too much all at once, but Black Ring is still brilliant. Maybe Demon Knights picks up and reads better in trades, and I'm willing to give the second collection a read based on your endorsement. But seriously, it's a great trade. I read almost the whole trade this morning before work, I just couldn't stop reading. The story has a good pacing, good character development and Neves' is a joy! And it is funny at times. I look forward to volume 2. I'm a big fan of The Demon, so I'll be picking this one up for sure! Interesting stuff in the air right now, or maybe reading too much Bleeding Cool just makes us all paranoid. Cornell affirms on Twitter that Demon Knights isn't cancelled -- that's not saying he's not leaving it, just that it isn't cancelled, unless his not leaving it was meant to be understood. Which would leave Cornell with ... no titles in the DC New 52? Which would be a shame; we can list which of his books have been hit or miss, but he's a nice guy and you know his books have a lot of thought behind them. So ... wait and see, I guess. What's going on at DC that they are leaving the titles or worse, the company? As a fan I'm trying not to get too disheartened by what does seem to be a host of talented people deciding they don't want to work for DC anymore. On the disheartening side, however, Greg Rucka's recent comments (via Bleeding Cool) seem to characterize the current landscape pretty well, that the emphasis these days is not on the creator but on the product, for better or worse. Thank you CE for the link. If that's the case, it does clarify things a bit. The thing is, how does a company measure the success of a title? 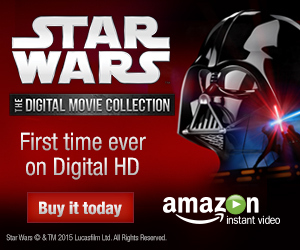 Is it based on the revenues or on the positive reviews? I don't keep track on DC's earnings, but it seems they are looking only at their short term revenues. When you look at the cancelled titles, there are some good ones that deserve to be continued. Trade Perspectives: What Makes a Marvel Epic?